Today we are very glad to announce that we are going to have Ellen Kristiansen as a Guest Designer for a couple of months. We are so excited to be taking part of her paper crafting talent, and we are sure she will bring out the best in our papers. So let’s give a warm welcome to Ellen, and let her tell us a bit more about herself and her interest for paper crafting! 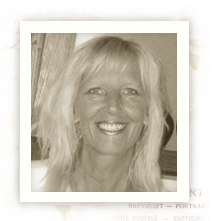 My name is Ellen Kristiansen, I’m 56 years old and I live in a little city by the sea, Sandefjord/ Norway. I am very honored to be a Guest Designer for Pion Design, the papers I’ve loved since the first sight. I’ve always been involved in some creative hobby, but I became “addicted” to this paper and stamp hobby around Christmas 2009, when I wanted to make my own Christmas cards for friends and family. What I like most is to create different types of cards, tags, and sometimes altered projects, and I use any free time to indulge myself in my hobbyroom.I love vintage and shabby style, while I like to try making some steampunk gentleman cards. I also love using the sewing machine on my cards/projects. It’s such an honour for me to be a Guest here at Pion Design, and look forward to showing you my creations. Wish you all a beautiful and creative day! 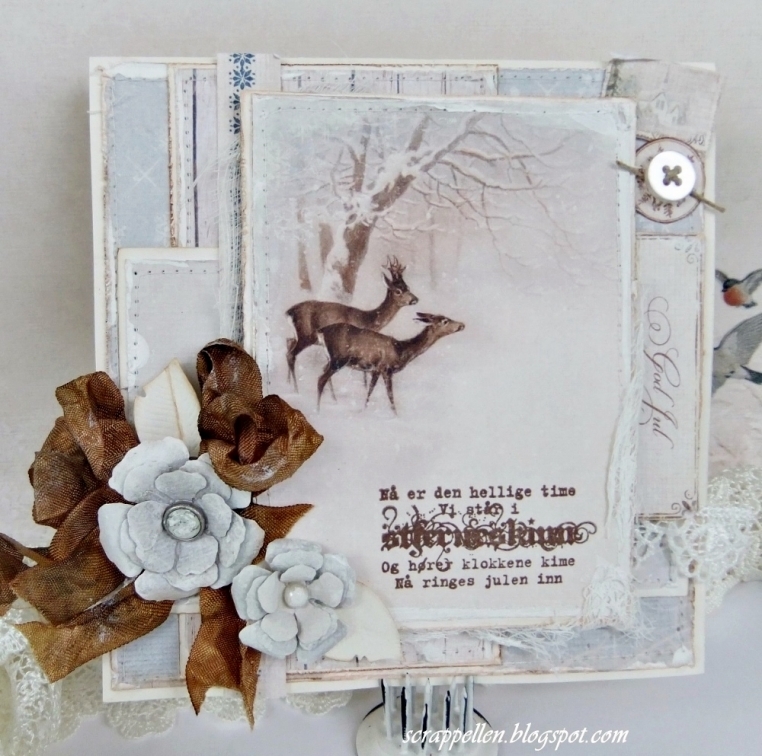 For my first card I’ve used some of the lovely bluetones sheets, “Deers” and “Icicles”, and the image are from the sheet “Images”. 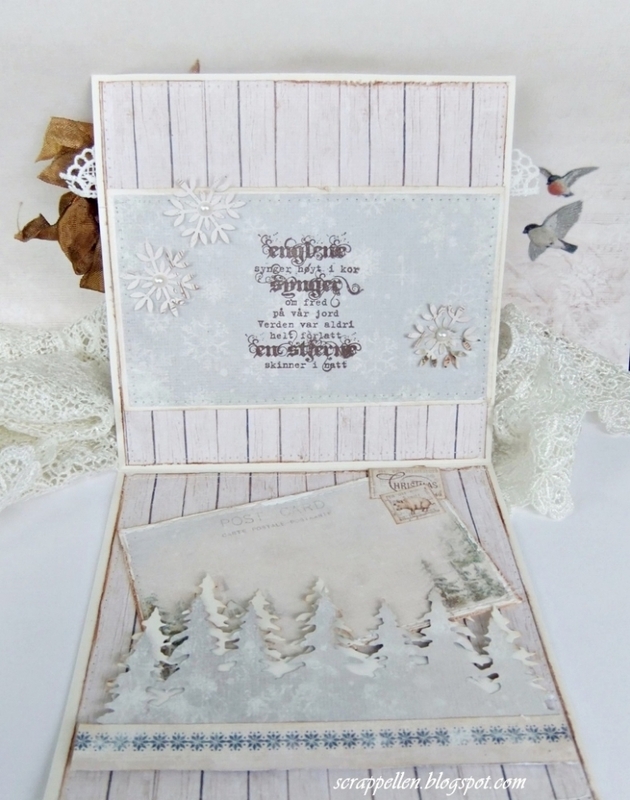 They are soo beautiful, and I really got the Christmas feeling when I created this card. I’ve distressed, and painted around the edges with Gesso. For the inside I’ve used the sheet “Images” on the panels, and a tag for personal greetings, from “Cut out”. I’m looking forward to sharing more Pion Designs creations with you in the future. I truly adore these papers. For et fantastisk kort! Helt nydelig! Congratulations Ellen!.. Will be fun to follow and see what you will make!.. Du har laget et vakkert julekort med disse nydelige papirene! Varm velkommen til deg, Ellen. Du lager de vakreste tingene og det er alltid en fryd å se ditt arbeid. Tuusen takk for en veldig koselig velkomst og kommentarer♥♥.